Pentobi is a free game. This means that the source code is available to be studied, modified, and distributed. Most projects look for help with testing, documentation, graphics, etc., as well. 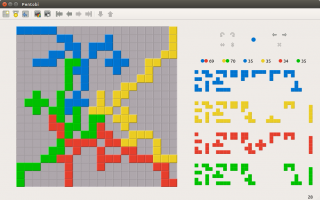 Pentobi is a Blokus‐playing program. Blokus is an abstract tile-placement board game with tiles shaped like polyominoes and simple rules. In addition to the classic version of Blokus, Pentobi also supports a number of game variants and similar games: Blokus Duo, Blokus Trigon, Blokus Junior, Nexos, GembloQ and Callisto. Pentobi officially supports Linux and Android. The Android version does not support the highest playing levels. Older versions of Pentobi also supported Windows, but Windows support has been dropped after version 12.0. According to one of the top Blokus players, Pentobi is the strongest Blokus-playing program. This page was last edited on 21 April 2019, at 07:30.